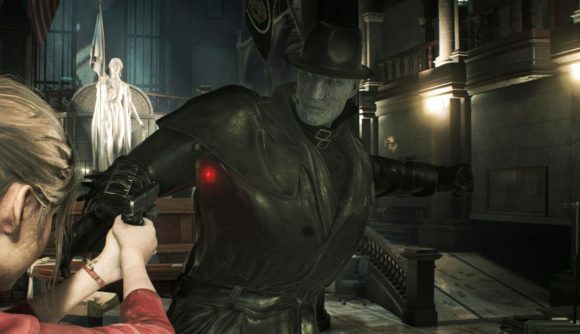 February 11, 2019 Resident Evil 2 finally has a Mr. X Gon’ Give It to Ya mod. While Resident Evil 3: Nemesis is the game best-known for siccing a giant, unkillable monster on you, Resident Evil 2 got a taste of that sort of thrill with Mr. X. Despite stalking you with deadly implacability throughout more than one segment of the remake, X’s hat and trenchcoat – and the way he gingerly treats doors – has given him a sort of goofy charm. So much so that I’m still calling ‘Mr. X gon’ give it to ya’ the best gaming gag of 2019. Now there’s a mod bringing that joke to life. By now, you’ve certainly seen the RE2 clips featuring the Tyrant, with his ambient music replaced by DMX’s classic track, X Gon’ Give It to Ya. It was previously the domain of YouTube videos and Twitter goofs, but now there’s a proper mod for the PC version which inserts the track into the game. You can grab it on the Steam forums, courtesy of user DJ Pop – as brought to our attention by VG247. It simply requires you to extra a zip file into the game’s directory and run an exe file to switch over the tracks. Here’s what the mod looks like in-game. My favourite clip from before the mod is still this longer treatment on YouTube. I’m still not over the sync on the “open up the door” line, and the fiery moment that follows is even better. At last, we can have that experience in the real game. Hopefully that lightens the mood a bit next time you’re running in terror from Mr. X. If you still need help, check out our general Resident Evil 2 guide, or more specific rundowns on how to unlock the Lightning Hawk Magnum and MQ11 or the Chemical Flamethrower and Spark Shot. The Tyrant will still be giving it to ya, but at least you’ll be able to clear out the zombies and Lickers threatening you along the way.